Very impressed with this company.. especially, our service technician, David! Response time was above expectations.. and so was his excellent & professional service! We will be sure to recommend The Pink Plumber. 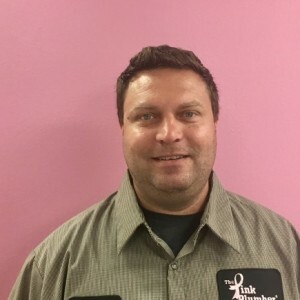 Our Pink Plumber Service Technician, David L., was on-time, courteous, knowledgeable, informative, professional, and a very cordial person. He assessed the situation, provided options for water heater replacement, returned in the estimated time period with the selected water heater, installed proficiently, and cleared out the old water heater. This is the type of contractor/technician that we were so happy to have service our needs. Thank you. I had Pink Plumber come out to fix an issue a month ago, and was so impressed with David Lankford that I called and asked for him again with a separate issue this week. I am very impressed with the thoroughness, integrity, work ethic and quality, and communication from this young man, and I am not easily impressed. Pink Plumber has a fine asset in David! Thank you for your rapid response and for employing such a fine representative of your company, Pink Plumber! 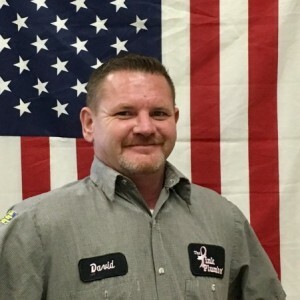 David L was fast , very friendly and really did a great job!!! Definitely would recommend! David was awesome! Very professional, great attitude and work ethic! David communicated with us from start to finish. He explained what he was doing every step of the way. I really appreciate a professional who is humble and reads the equipment manual to ensure he completed the job as required by the manufacture. There was no "winging it". It was obvious David strives to do the job right the first time! When I need plumbing support in the future, I will be requesting David! Thank you David and Pink Plumber! I could not be more pleased or relieved with the service provided by David! He arrived earlier than expected, fixed an ongoing issue in a matter of minutes, removing a huge amount of stress for me, and came in well below the expected cost! I highly recommend Pink Plumber and especially David Lankford. I will call again with any future plumbing needs. Thank you, thank you, thank you! David Lankford was absolutely amazing. By far the best service man my husband and I have ever had to deal with. Honesty is the best policy and that is his number one target. We reached out to two other companies that never came through or even called us back. Played the waiting game from 11am to almost 6pm! David gave us an hour window and he was there in 20 minutes. And stayed for almost 2 hours! Even helped us with random questions regarding insurance claims and his opinions on the problems at our home. We will be using him now and in the future. As long as he is still In business and working he is our number one guy! Incredible service and extremely kind!! We are so impressed with him, this company and the fast turn around! Thankful to have him work on our home. If we could rate 100 stars for David we would! David is wonderful. He was the tech that responded to our original problem and knew exactly what was going on this trip. He is prompt, polite, professional, knowledgeable, warm, friendly, an asset to the company. I will consistently request his services whenever I need services from a plumber again. He should be training other service personnel on how to interact with customers to build repeat business. worked hard and clean to solve water heater problem. seems fine now. was courteous and cooperative. made suggestions for other fix issues. I liked the clean van and the pleasant plumber. The company was expensive, but they made good on a problem promptly which made them a hero. David L was very courteous and patiently listened to our needs. Took time to review other aspects of our repair that may need fixing. Asked if theret was anything besides the repair that we wanted done. Offered us options and worked hard to give us the best price. The work was cleanly done and looks great. Thank you and thank you for your support in fighting breast cancer. Arrived as promised. Very professional. David went beyond expectations.